The first time we heard David Thomas' take on punk vocals, we were sure the pitch control on our turntable was broken. We had similar concerns the first time we listened to My Bloody Valentine's Loveless, but that's a digression best saved for June. Thomas screamed from our speakers like a more frenetic Bryan Ferry, always ready to sacrifice fully pronouncing his lyrics in the interest of rhythm. He has the sort of voice that defies imagining a face behind, which loaded our attendance of Thursday's performance of Bring Me the Head of Ubu Roi at Southbank Centre with an extra degree of anticipation, as we'd never seen Pere Ubu live before. When Thomas first walked out on stage, he looked a lot like Orson Welles to us. Somehow this made sense. It's nice to have things make sense, especially when attending absurdist theatre. An adapation of Alfred Jarry's 1896 play Ubu Roi, Bring Me the Head of Ubu Roi stars David Thomas in the lead role as Père Ubu, the character after which he named his band. Père Ubu is an overbearing, stupid and generally repulsive man, who throughout the work berates everyone around him for just about everything. Over the course of two acts, his frequent fights with Mère Ubu escalate into a Macbethian murder of the King of Poland, Père Ubu's unexpected rise to power and his eventual defeat by the Russian Army. At least we think that's what happened. A cohesive plot isn't the thing to go looking for in a Jarry play, however, because you won't find it. This disregard for the narrative sparked outrage in the playwright's time, with riots breaking out at performances as the on-stage anarchy tore down the final barrier with its audience by inciting violence off-stage. In 2008 art riots seem not only impossible, but quaint, so this reimagination of a classic has a difficult struggle to find contemporary significance. Nevertheless it finds it in the elements of Ubu Roi that remain universal today. Thomas' production emphasises these aspects of Jarry's original, as one can see analogies to contemporary abuses of power throughout. Père Ubu brutishly stumbles through his own rise to power and his followers chant, "Long live Ubu, hooray for war!" As Thomas himself notes, "Whoever you personally think is the Bad Guy - whether you demonize those on the Left or the Right, or everyone In-Between, the Church or the State, Big Business or Big Labor - Père Ubu can supply the face and voice." It's hard not to delight in Thomas' frustrated dictatorship of both Poland and the production itself. He plays the role with obvious love and humour. Deviating from the plot to demand that the scene fade to black (which it always did, of course, by way of someone running past with a sign reading "Fade To Black") as he urges, "Hurry up, I want to make some laws! ", Thomas displays an enthusiasm for the work that quickly spreads to the audience. When two of the characters exclaimed, "I think we're in danger of alienating the audience! ", Queen Elizabeth Hall erupted in laughter. It was hilarious, in part at least, because it couldn't have been further from the truth. 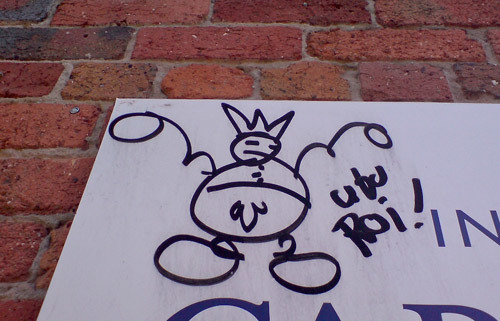 Image of Ubu Roi taken from lonely radio's Flickr photostream.